For the modern headwear known as a "tuque", see Knit cap. For other uses, see Toque (disambiguation). 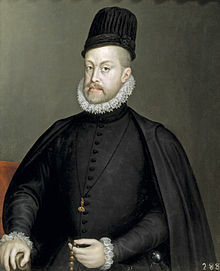 King Philip II of Spain, wearing the Spanish Tocado, late 1500s. Painting by Sofonisba Anguissola. A toque (/toʊk/ or /tɒk/) is a type of hat with a narrow brim or no brim at all. Toques were popular from the 13th to the 16th century in Europe, especially France. The mode was revived in the 1930s. Now it is primarily known as the traditional headgear for professional cooks, except in Canada where the term is primarily used for knit caps. The word has been known in English since 1505. It came through the Medieval French toque (15th century), presumably by the way of the Spanish toca "woman's headdress", from Arabic *taqa 'طاقة' for "opening". and "طاقية" "taqia" for "hat" originally for something "round" that has an opening. The word toque is Breton for "hat". The spelling with the "que" is Middle Breton, and Modern Breton is spelled tok. Old Breton spells the word toc. The word was borrowed into the French language both for the chef's uniform and the knit cap. Fashion drawing from 1800 with ladies wearing toques. Tasseled toque from 1917 New York. 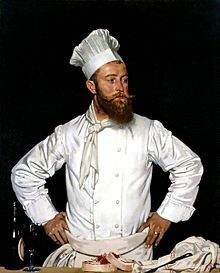 A toque blanche (French for "white hat"), often shortened to toque, is a tall, round, pleated, starched white hat worn by chefs. The toque most likely originated as the result of the gradual evolution of head coverings worn by cooks throughout the centuries. Their roots are sometimes traced to the casque à meche (stocking cap) worn by 18th-century French chefs. The colour of the casque à meche denoted the rank of the wearer. Boucher, the personal chef of the French statesman Talleyrand, was the first to insist on white toques for sanitary reasons. The modern toque is popularly believed to have originated with the French chef Marie-Antoine Carême (1784–1833), who stiffened the casque à meche with cardboard . A toque, or sometimes touge, was the traditional headgear of various French magistrates. A low type in black velvet, called mortier (also rendered in English as mortarboard), was used by the président à mortier, president of a parlement (the royal highest court in a French province), and of the members of two of the highest central courts, cour de cassation and cour des comptes. A red toque is sometimes worn by German judges, primarily by justices on the Federal Constitutional Court. The pleated, low, round hat worn in French universities – the equivalent of the mortarboard or tam at British and American universities – is also called a toque. In the Napoleonic era, the French first empire replaced the coronets of traditional ("royal") heraldry with a rigorously standardized system (as other respects of "Napoleonic" coats of arms) of toques, reflecting the rank of the bearer. Thus a Napoleonic duke used a toque with seven ostrich feathers and three lambrequins, a count a toque with five feathers and two lambrequins, a baron three feathers and one lambrequin, a knight only one ostrich feather (see Nobility of the First French Empire). Toque is also used for a hard-type hat or helmet, worn for riding, especially in equestrian sports, often black and covered with black velvet. In Canada, tuque /tuːk/ is the common name for a knitted winter hat, or watch cap (sometimes called a beanie in other parts of the world); the spelling "touque", although not recognized by the Canadian Oxford Dictionary, is also sometimes seen in written English. The Canadian-English term was assimilated from Canadian-French tuque. Toque first appeared in writing around 1870. The fashion is said to have originated with the coureurs de bois, French and Métis fur traders, who kept their woollen nightcaps on for warmth during cold winter days. Such hats are known in other English-speaking countries by a variety of names, including beanie, watch cap or stocking cap; the terms tuque and toque are unique to Canada and northern areas of the United States close to the Canada–United States border. In recent years toques have resurfaced as an extremely popular fashion item, they are used all year round seen not only used outdoor for weather but as an indoor fashion accessory. Many toque are used to promote or advertise as items of Canadian memorabilia i.e. Canadian NHL hockey teams, Canadian Provinces and cities and many more popular culture artifacts. ^ "the definition of toque". Dictionary.com. ^ a b "Definition of Toque". Retrieved 11 January 2014. ^ "toque (n.)". Etymonline.com. Retrieved 11 January 2014. ^ "Definitions for: Toque". Retrieved 11 January 2014. ^ Bedell, Jane (2013). So, You Want to Be a Chef? : How to Get Started in the World of Culinary Arts. Simon & Schuster. p. 69. ISBN 978-1582704364. ^ Engber, Daniel (28 March 2014). "Who Made That Chef's Toque?" – via NYTimes.com. ^ http://www.cbc.ca/news/canada/edmonton/thousands-vote-on-correct-spelling-of-canadian-knit-cap-1.2457737, CBC News: Thousands vote on correct spelling of Canadian knit cap, Retrieved Dec. 22, 2015. ^ "toque" and "tuque" in Katherine Barber, ed. (2004), The Canadian Oxford Dictionary (2nd ed. ), Don Mills, Ontario: Oxford University Press, ISBN 0-19-541816-6. ^ "toque" and "tuque" at Merriam–Webster Online. ^ Dec 09, CBC News · Posted:; December 10, 2013 9:38 PM MT | Last Updated:; 2013. "Thousands vote on correct spelling of Canadian knit cap | CBC News". CBC. Retrieved 2019-03-26. 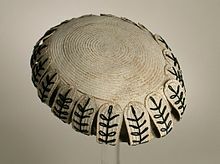 Wikimedia Commons has media related to Category:Toques (headgear).